The African-American musical tradition is a vast one, extending as it does from that day 400 years ago that the first enslaved Africans were brought to the English colonies that became the United States, to the hip-hop titans of our current popular music universe. And while much of that music is steeped in sorrow, there is also much of it that expresses joy in life, and Seraphic Fire’s current week of concerts does an exemplary job of drawing our attention to it. 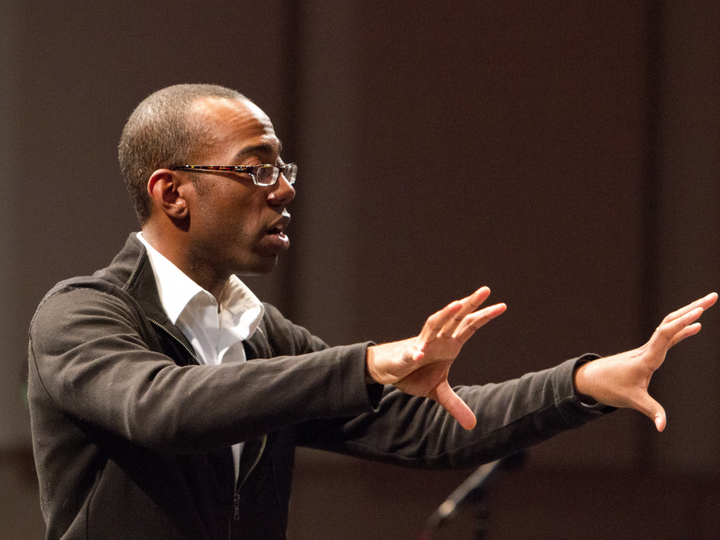 I Have a Dream: Music from the African-American Tradition is compiled from a corpus of 20 pieces, most of them written by black composers, and led by Boston Children’s Chorus director Anthony Trecek-King, the guest conductor for this program. On Thursday night at St. Gregory’s Episcopal Church in Boca Raton, the 13 men and women of Seraphic Fire ranged from fresh contemporary music to near-gospel stylings that drew effusive acclaim from the audience. Trecek-King chose 15 of the pieces in the program to do Thursday night, two of which were freshly created by black American composers: New York-based Trevor Weston and Nebraska’s Marquese Garrett. Weston’s motet, Nigra Sum, drawn from the Bible’s Song of Songs, normally reads in Latin: Nigra sum sed formosa, or I am black but beautiful; Weston has changed it to Nigra sum et formosa, or I am black and beautiful, as Trecek-King pointed out. Weston’s motet is written in a strongly contemporary style, with each syllable of the text laid out in pointillist fashion to start and then building in harmonic complexity as it goes on. It’s a powerful, somewhat unsettling setting of this text, and one that matches its spirit of independence and pride. This is home territory for Seraphic Fire, and they gave it a pristine performance. Garrett’s My Heart Be Brave, set to a text by James Weldon Johnson, the pioneering black writer and editor of the early 20th century, is very much in line with a good deal of contemporary sacred music, with a big, singable melody, sweet pop-like harmonies and an overall feeling of warmth and positivity. Less demanding than Weston’s motet, it is nonetheless a solid addition to current sacred composition. Black spirituals are a crucial body of folksong in the American experience, and Trecek-King offered two of his own arrangements: “I’m Building Me a Home,” which opened the program, and “Ain’t Nobody Gonna Turn Me ’Round,” which is a spiritual that was transformed into a civil rights anthem. Both arrangements were straightforward and effective, with unison singing in the men’s voices answered by gentle minor-key harmonies by the rest of the choir in the first spiritual. The second, befitting its status as a song of defiance, was immensely forceful, with Trecek-King joining his singers on the altar halfway through to take part in the message. Adolphus Hailstork’s overly fussy arrangement of “Go Down, Moses” featured an exceptional solo by bass Enrico Lagasca, a smallish man with a huge, bronze-like basso profundo instrument who made the most of his repeated exhortations to “Let my people go.” Another fine solo came from soprano Arwen Myers, who gave Evelyn Simpson-Curenton’s arrangement of “Lord, How Come Me Here?” a deep poignancy. Her voice has a distinctive, mature coloring that filled the despairing text with palpable feeling. The concert contained, as always, much moving about of the singers, including for two pieces that alternated women’s and men’s voices. The women (along with countertenor Reggie Mobley) tenderly sang Abe Meeropol’s brutal song about lynching, “Strange Fruit,” while the men listened. Next up, the men sang A.C. Bilbrew’s “The Death of Emmett Till,” an amateurish song about the well-known 1955 killing of a visiting black Chicago teen in Mississippi; its devastating story is hard to take in a bouncy major-key setting that sounds like a Bonanza outtake, but the singers acquitted themselves well. Trecek-King also put the spotlight on two works by important early 20th-century black composers, with performances of R. Nathaniel Dett’s Hew ’Round the Tree and Florence Price’s Resignation. Dett’s motet was slight but well-written; Price’s was more elaborate, and richly late Victorian in musical language. Both works were sung with care and elegance. This concert proved to be a good selection of often unfamiliar music, and one that didn’t skimp on familiar spirituals. Trecek-King was a pleasure to watch for his expressive conducting and his restless energy, and Seraphic Fire’s singers showed they were comfortable in any number of musical styles. In several cases, such as “Bound for Canaan’s Land,” they seemed to be on the verge of breaking out into a revival meeting, and the audience would have been happy to join them. Trecek-King picked up a djembe and beat out the rhythm as he and the choir marched into the vestibule on the last song, “We Are the Ones We Been Waiting For,” by Bernice Johnson Reagon, founder of Sweet Honey in the Rock. Like much of the music on the program, it embodied in a modest way the aspirations of a people, which surely gave the audience something more to ponder than solely musical concerns. Seraphic Fire performs this program at 4 p.m. today at the South Miami-Dade Cultural Center in Cutler Bay. Tickets: $60. Call 305-285-9060 or visit www.seraphicfire.org.